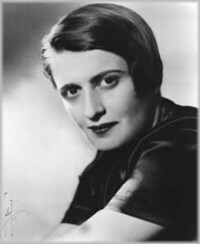 One thing that Ayn Rand definitely accomplished in her life was invoking thought and challenging the status quo through her philosophy. She called her philosophic style "objectivism". She described it as "the concept of man as a heroic being, with his own happiness as the moral purpose of his life, with productive achievement as his noblest activity, and reason as his only absolute." Her point of view and literary works were considered very controversial by many. Today people still value and challenge her life's work and teachings. Here is a list of 20 statements made by Ayn throughout her life. Some you may love, some you may hate either way try to insert them into the context of your life before creating an opinion. Let us know what you think in the comments below. 2. People create their own questions because they are afraid to look straight. All you have to do is look straight and see the road, and when you see it, don't sit looking at it - walk. 3. The ladder of success is best climbed by stepping on the rungs of opportunity. 4. The purpose of morality is to teach you, not to suffer and die, but to enjoy yourself and live. 5. The question isn't who is going to let me; it's who is going to stop me. 7. To achieve, you need thought. You have to know what you are doing and that's real power. 8. Upper classes are a nation's past; the middle class is its future. 9. A creative man is motivated by the desire to achieve, not by the desire to beat others. 10. Contradictions do not exist. Whenever you think you are facing a contradiction, check your premises. You will find that one of them is wrong. 11. Do not ever say that the desire to "do good" by force is a good motive. Neither power-lust nor stupidity are good motives. 12. Money is only a tool. It will take you wherever you wish, but it will not replace you as the driver. 13. Government "help" to business is just as disastrous as government persecution... the only way a government can be of service to national prosperity is by keeping its hands off. 14. I swear, by my life and my love of it, that I will never live for the sake of another man, nor ask another man to live for mine. 15. Civilization is the progress toward a society of privacy. The savage’s whole existence is public, ruled by the laws of his tribe. Civilization is the process of setting man free from men. 16. Individual rights are not subject to a public vote; a majority has no right to vote away the rights of a minority; the political function of rights is precisely to protect minorities from oppression by majorities (and the smallest minority on earth is the individual). 17. Run for your life from any man who tells you that money is evil. That sentence is the leper’s bell of an approaching looter. 18. The worst guilt is to accept an unearned guilt. 19. There is a level of cowardice lower than that of the conformist: the fashionable non-conformist. 20. The most depraved type of human being is the man without a purpose.